What are you doing on Sunday, July 23? If you like locally sourced homemade food, beautiful farm land, and a leisurely stroll, then head up to Hanson’s Ridge in Springvale for the farm walk. 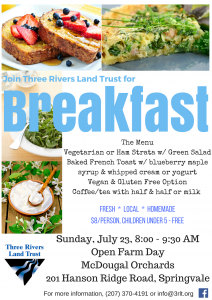 Fuel up before hitting the farm to farm trail by enjoying breakfast at McDougal Orchards hosted by us–your friends at Three Rivers Land Trust. The menu features farm fresh ingredients sourced from local farms. The farm walk celebrates the very best of local agriculture in our area as it takes you through fields, orchards, woods and pastures. 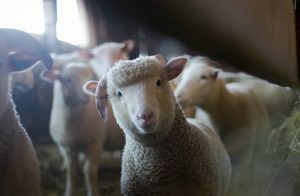 Organized by Sanford Trails and participating farms, the walk features farms that raise sheep, Christmas trees, mushrooms, vegetables, berries, and apples. Some also make cheese, bottle hard cider and make maple syrup. The walk is a four-mile, self-guided walk that connects to ten farms. Walkers may chose to do the entire trail or hop on and off using the shuttle service provided by Sanford Trails. The path is well-marked and generally follows gentle terrain. Walkers may start and end anywhere. There are a few rough spots, but certainly walkable by children. Sturdy, comfortable shoes are recommended. We welcome dogs on leashes and owners who pick up after them. Parking is available at McDougal Orchards, 201 Hanson Ridge Road, and Carpenter Tree Farm, 14 Hazen Drive – off Blanchard Road. For more information, check out this map of the farm walk trail. Both the breakfast and the farm walk are held rain or shine so be prepared with rain gear, if necessary. Have you attended the farm walk in the past? Share your experience on our Facebook page.